This year, give the gift that keeps on giving! A subscription to a music-making magazine delivers 13 issues across the year, each packed full of new ways to play, new tricks to learn and the pick of the best gear to buy. The ultimate tutorial-based guitar magazine. 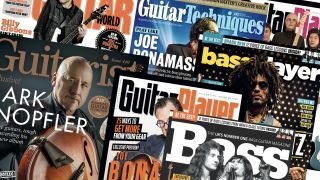 A Guitar Techniques subscription nets you the world's foremost tuition-only guitar magazine and access to the most highly regarded tutors in the industry. The UK's foremost magazine title for passionate drummers and percussionists of all levels. Since 1985, Rhythm’s global team of percussion experts has delivered the most authoritative, user-friendly and exciting drum magazine on the planet. Guitarist's Buy and Play The Acoustic Guitar helps you get started with the acoustic guitar, with bite-size lessons from some of the best guitar tutors in the business – covering everything from altered tunings and acoustic Latin techniques to quick-start guides on recording your acoustic and getting a great sound when playing live. Piano for Beginners is an essential guide for piano and keyboard first-timers. Simplifying the process through step-by-step tutorials, it will help you lay solid foundations for years of enjoyment. From the correct way to sit at the piano to reading notation, we start with the basics before expanding your musical horizons with easy home recording and genre-specific tutorials. Your essential guitar guide, Total Guitar Annual 2018 is packed full of essential features, interviews, maintenance tips, playing guides and more. Also includes easy-to-follow tab and free downloadable audio files to help you play better guitar now. For Play Like Your Heroes: Blues, Guitar Techniques trawled the archives for some of the best blues-based lessons from our exceptional roster of tutors and players. There’s so much great stuff here that it could literally keep you busy for months. The range of techniques and styles covered is huge; there’s rhythm, slide and stylised licks from the legends of blues; style studies on seven players that we thought deserved special mention; and it all culminates in an amazing essential blues chords feature. This binder is suitable for storing all of our monthly magazine titles, and stores a year’s worth of your favourite magazine.